French President Emmanuel Macron, whose approval rating recently hit pathetic new lows, attacked the hugely popular nationalist leaders of Italy and Hungary on Wednesday and said he's the "main opponent" to nationalism. "It's clear that a strong opposition is developing between nationalists and progressives and I will yield nothing to nationalists and those who advocate hate speech," Macron told reporters in Copenhagen. "If they want to see me as their main opponent, they're right." 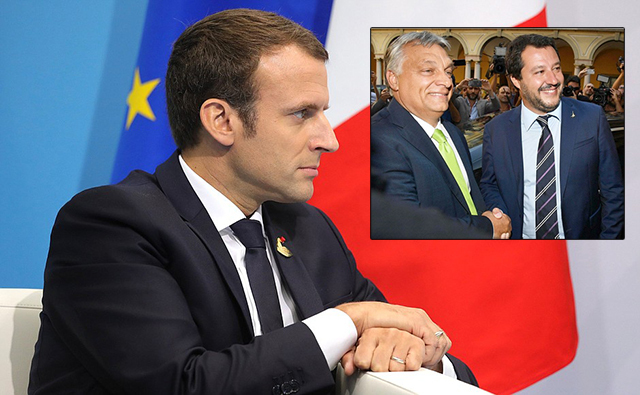 French President Emmanuel Macron upped his war of words with the nationalist leaders of Italy and Hungary on Wednesday (Aug 29), saying they were right to see him as their �main opponent� on migration. His comment came after Hungarian Prime Minister Viktor Orban and Italy�s far-right Interior Minister Matteo Salvini launched an anti-migration manifesto, name-checking Macron as their adversary. Orban recently won reelection handily and his Fidesz party's popularity hit 54 percent in June, with the strongest opposition party, Jobbik, who are even further to the right, coming in second at 19%. Judging by his terrible performance, Macron is not the number one enemy of Salvini and Orban, but the number one enemy of the people of France!